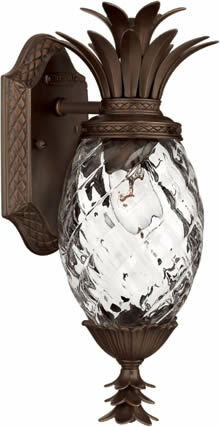 Solid Brass with Copper Bronze finish and Clear Optic Glass on a Pineapple Shaped Outdoor Fixture. 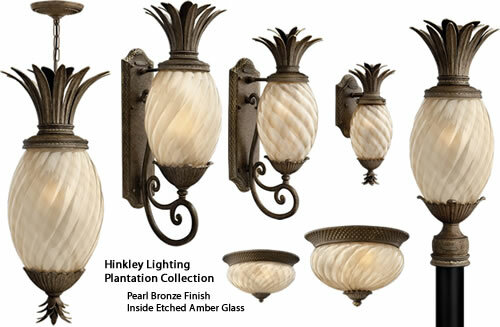 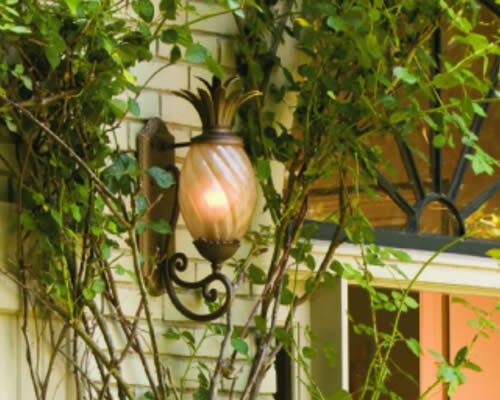 Width 10.3" x Height 25.25"
Width 12.5" x Height 29.5"
Cast Aluminum in Pearl Bronze finish and Inside Etched Amber Glass on a Pineapple Shaped Outdoor Fixture. 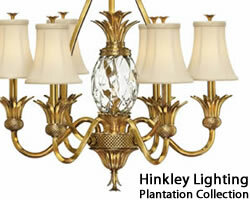 Coordinates with the Plantation Indoors and Outdoors Collection. 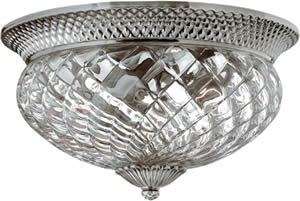 Width 10.3" x Height 25.3"
Width 6" x Height 14"
Backplate Width 4.8" x Backplate Height 8"
Backplate Width 5" x Backplate Height 16"
Width 10.3" x Height 28"
Backplate Width 5" x Backplate Height 20"
Width 12.5" x Height 34"
Backplate Width 5" x Backplate Height 24"
A Hinkley classic, the ornate Plantation collection features exceptional pineapple-shaped, clear optic glass that makes a noble statement with elaborate, decorative cast detailing. 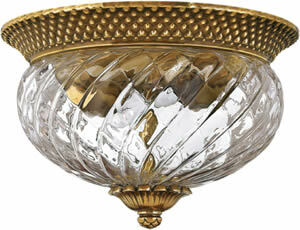 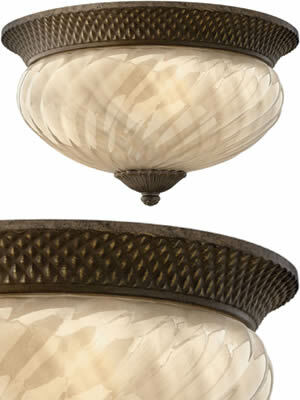 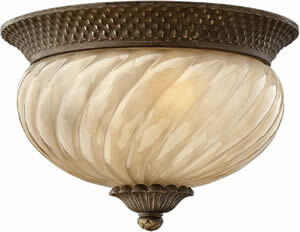 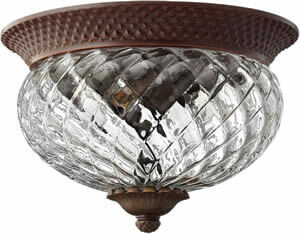 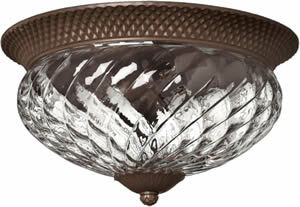 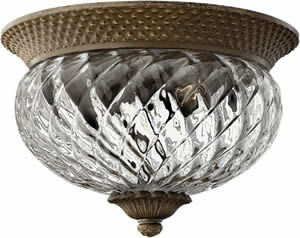 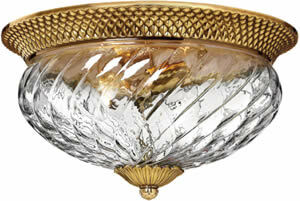 Available in Solid Brass with a Burnished Brass finish or Cast Aluminum with a Pearl Bronze finish. 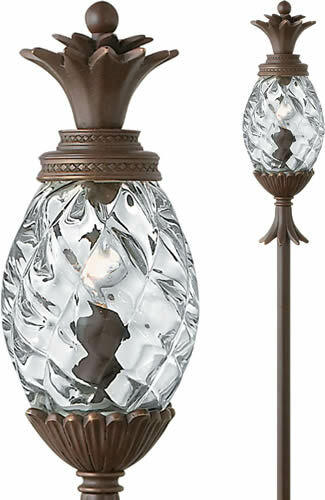 Some pieces are also available in Copper Bronze, Polished Antique Nickel or Pearl Bronze finish with Inside Etched Amber glass. 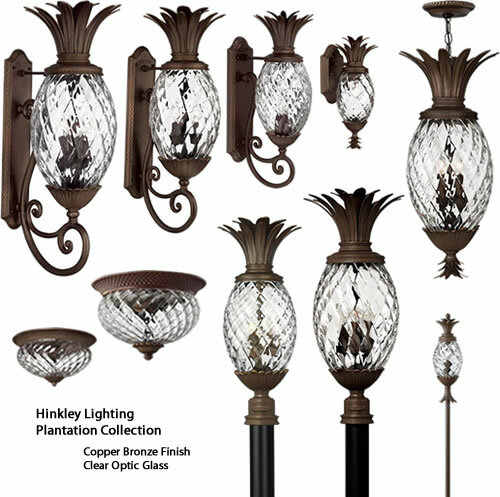 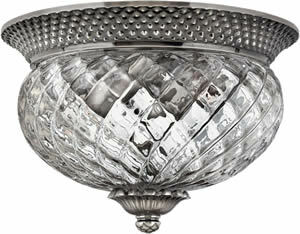 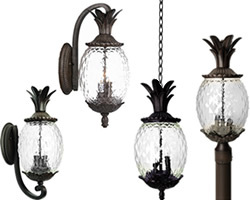 The collection includes small to large chandeliers, wall brackets with glass diffusers or fabric shades, mini-pendants, foyer pendants, downlight dinette pendants, flush ceiling lights and bath lighting. 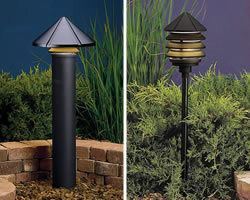 There is coordinating outdoor lighting and landscaping path lighting. 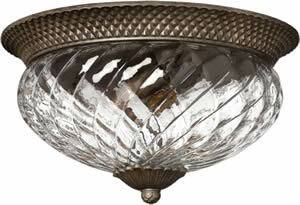 Width 12.5" x Height 28.5"
Width 12" x Height 8"
Width 16" x Height 8.8"